How Can I Prove I’m the Victim of a Hostile Work Environment? No one should deal with a hostile work environment. It can have a devastating impact on both your work life and home life. It can ruin your career, expose you to physical pain and mental anguish, and severely limit your earning power. Here we’ll explore what constitutes a hostile work environment, and what you can do if you’re involved with one. The hostile actions involve discriminating against a protected class, such as people with disabilities or members of a certain race, gender, nationality, sexual orientation, or religion. The hostile behavior must take place over a long time and not be limited to a comment or two that a co-worker found annoying. The incidents should also have been reported to the human resources department. The behavior does not stop after it has been investigated by human resources or human resources fails to investigate or intervene. The hostile behavior is considered severe, which can mean that in addition to being offensive, it interferes with the victim’s work or attempts at career advancement. The victim’s employer is/was aware of the hostile behavior and failed to properly intervene. Sexual harassment – Repeatedly making unwanted sexual advances towards a co-worker despite being told to stop. Race discrimination – Harassing and mistreating someone because of his or her racial background. Gender discrimination – Mistreating someone because of their gender. Religious discrimination – Harassing someone because of his or her religious beliefs. Sexual orientation discrimination – Discriminating against someone because of his or her sexual preferences. Nationality discrimination – Mistreating a person because of his or her nationality. Age discrimination – Treating someone unfairly because of his or her age. Can the Equal Employment Opportunity Commission Help? The Equal Employment Opportunity Commission (EEOC) can be an option for employees who are suffering as the result of being exposed to a hostile work environment. The EEOC is in place to enforce employment laws and protect victims of workplace discrimination and harassment. The EEOC may be able to investigate your hostile work environment complaints and help you avoid further mistreatment, including retaliation for reporting the incidents to your employer. 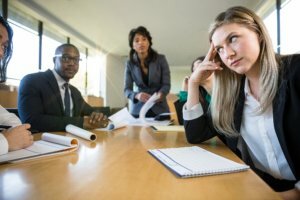 The EEOC can act as a mediator to help settle the dispute, and if necessary, the EEOC may be able to file a civil lawsuit against your employer on your behalf. Should I Sue My Employer for Creating a Hostile Work Environment? As mentioned above, there are steps hostile work environment victims must proceed through before they can pursue a lawsuit against their employer. However, legal action is absolutely something that victims of a hostile work environment should pursue if possible. Even if hostile work environment victims do not believe pursuing a lawsuit will be necessary to resolve the issue, they should still meet with an employment attorney to discuss their situation before deciding whether to file a lawsuit or not. In many cases, an experienced employment attorney will talk with you for free, including analyzing your situation, explaining whether you have a valid case, answering your questions, and discussing the best steps for you to take going forward.